Download our FREE mobile app & start networking at the 24/7 Expo to supports kids in foster care starting their own business while connecting with proven experts that specialize in getting MASSIVE RESULTS! Promote your offer, website, or giveaway completely FREE! Do you own a business that get's PROVEN RESULTS? Do you do business with business owners & entrepreneurs? Fill out the short form below to apply for a booth at our 24/7 Expo! 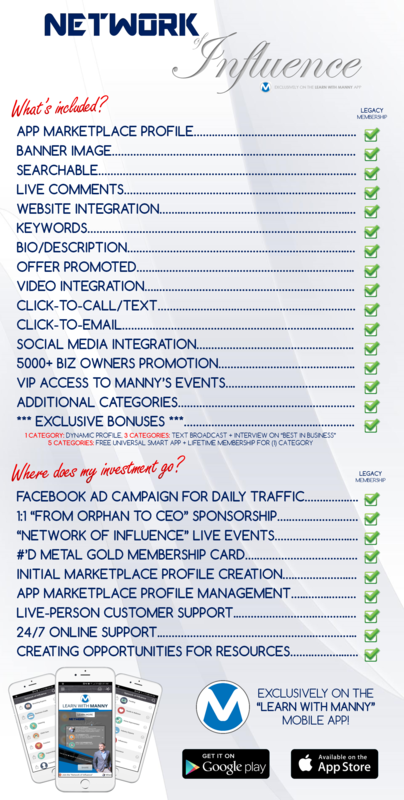 - SUPPORT ORPHANS: Every $250 raised within the "Network of Influence" program, an orphan is sponsored to start their own business through Manny's new TV show, "From Orphan To CEO"
- EXCLUSIVITY: Membership is limited to 2 per city, per industry! - PROMOTION: New members are promoted to thousands of business professionals nationwide! 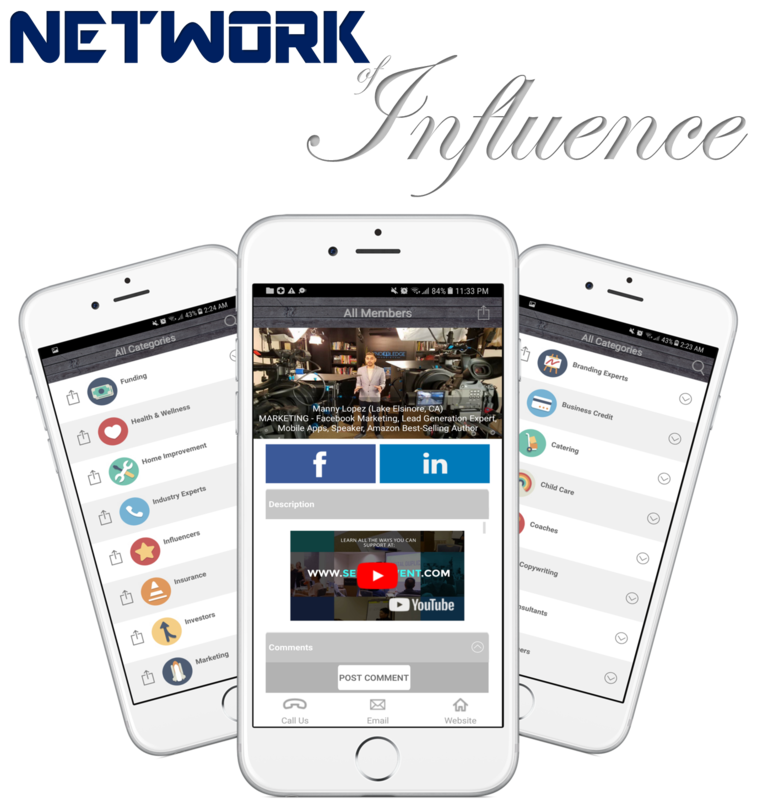 - EVENTS: Each approved member of "Network of Influence" will receive a GOLD Membership card that will display their member #. 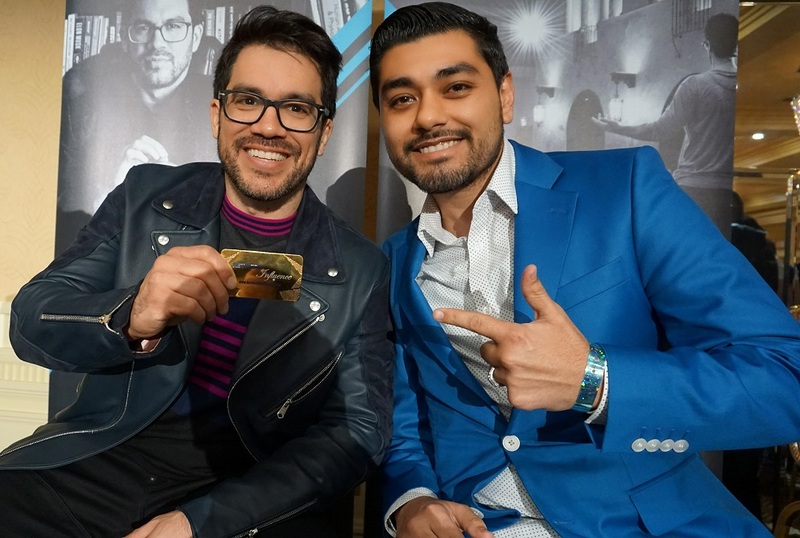 Members are able to use their GOLD Membership card to gain access to Manny's hosted events at NO COST for entry, food & networking! "ASK FOR THE GOLD CARD"
SECURE YOUR INDUSTRY-EXCLUSIVE POSITION TODAY! This will be your 'bio' within the app! Users read this! We can add a playable video in your profile! This can help Manny know where best to find you customers! 1. Search by keyword, phrase, name, company, etc. - Up to 5x the promotion when we announce their membership! - Being found in up to 5 different categories! - Up to 5x the searchable keywords to be found! - Up to 5 orphans sponsored from Manny's show "From Orphan To CEO"
Share something you can giveaway or offer as value for users to take action on!